Jonathan Fierce, a profiler for the FBI gifted with psychic abilities, failed to stop an explosion which has just killed his team of fellow agents, the only real family he’s ever had. The FBI wants to charge him with the crime. Now he’s being hunted by the Feds and is on the run from the crime syndicate that killed his team. Miraculously, Fierce can hear the voices of his slain teammates, giving him the skills and abilities to become a one-man strike force. Now he’s going deep under cover into the Jamaican underworld to strike at the heart of the syndicate and uncover the facts behind the conspiracy against him. Collecting the four-issue series. This is what I call, a Pleasant Surprise. I’d never heard of this comic before, I was just looking up something else on my iPad last Thursday, and I happened to see this advertised in the Dark Horse digital app, and so I bought it. And boy am I happy that I did. 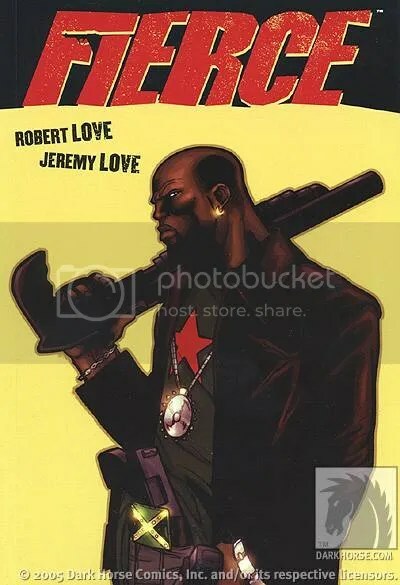 This book is from writer Jeremy Love, and artist Robert Love, the brothers behind a company called Gettosake Entertainment, this is one Hell of an action-packed story. The FBI discovered Jonathan Fierce when he was 8 years old, as he had a knack for predicting when certain crimes would happen. Jump forward 20 years and he’s their top profiler. When what should be a routine operation goes deadly wrong, Fierce is desperate to clear his name and bring the bad guys to justice. But this isn’t just a by the numbers action/revenge tale. While it is heavy on the action, the Jeremy knows just when to take a break in the story to give us some deep characterization, seeing Fierce interacting with his coworkers and his therapist, as well as flashbacks into his sometimes brutal childhood, from a young boy to his teens. Jamaican gang-lords, female African ninja assassins, international conspiracies, this story has it all. And Robert’s art is a beautiful thing to behold. It’s a visual marvel, like watching a movie on paper. I don’t want to give too much away but, trust me, get this! I give it a rare FIVE STARS. Available digitally and in print from DARK HORSE COMICS.